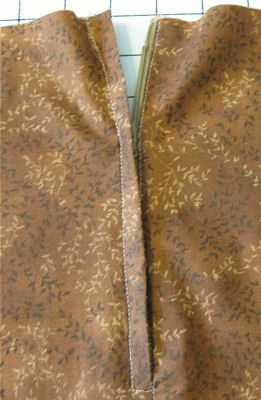 A lapped application zipper has one line of fabric showing on the outside with the appearance that all of the fabric is on one side. It is most commonly seen in slacks and skirts and is sewn with an all-purpose zipper. A centered zipper application is the easiest but a lapped zipper is not difficult if you take things one step at a time. Be sure your pattern has allowed a full 5/8" seam allowance before cutting the fabric. Add to the pattern if necessary to have a full 5/8" seam allowance where you will be inserting the zipper. Tip - If you tend to not have enough seam allowance when you insert lap application zippers, cut your fabric with extra seam allowance,​ ​marking and ​sewing the intended seam line. Trim away excess seam allowance when you are finished. Transfer the pattern marking for where the zipper will end in the seam. Fuse a strip of 1" wide lightweight interfacing to the seam allowance where the zipper will be located, placing it a scant 1/8" from the raw edge of the seam allowance. Sew the seam, basting the area where the zipper will be and backstitching at the bottom of the zipper when changing to a regular stitch length, using a full 5/8" seam allowance. Apply a seam finish without losing any width of the seam allowance. A zigzag stitch type of seam finish is good but be sure the tension is set so the fabric does not pull in under the thread. Press the seam as it was sewn and press open. Set up your sewing machine with the zipper foot. Your sewing machine manual will explain how your sewing machine's zipper foot is adjusted for the steps required to sew in a lapped zipper application. With the wrong side of the fabric up, place the zipper, right side down, on the right seam allowance, moving the fabric to the left side, out from under the seam allowance. Place the zipper face down on the seam allowance with the teeth on the seam line. Baste the zipper tape to just the seam allowance, sewing 1/4" from the outer edge of the zipper tape. Sew the tape to the edge using 1/4" seam allowance from the edge of the zipper tape. Turn the zipper right side up with the seam allowance folded under. Switch the side of the zipper foot and topstitch close to the fold of the fabric. Lay the zipper and fabric out flat with the zipper laying so the right side of the zipper is laying flat against the seam allowances. Mark the bottom of the zipper on the right side of the fabric using a straight pin. Place the fabric right side up on the sewing machine. Insert the sewing machine needle at the bottom of the zipper in the seam line. Use a​ lock-stitch (if your machine has one) or pull the threads to the back when you are done sewing in the zipper. Sew perpendicular to the seam to anchor the bottom of the zipper, stopping with the needle down. With the sewing machine needle down, raise the presser foot and pivot, to sew the unattached side of the zipper tape. Sew to the top end of the zipper. Take your time and carefully rip out the basting stitches that are holding the original seam closed so that you do not accidentally cut the fabric.